Do you want to have an eggcelent (sorry, couldn’t resist) Easter this year? I have 5 ideas that you can use to capitalize on Easter in your direct sales or party plan biz. 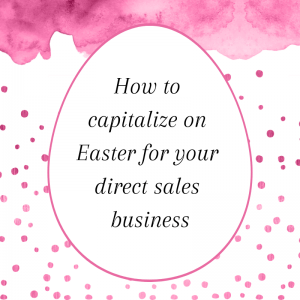 Create an Easter-themed booking incentive by adding some brightly colored Easter eggs with a product. Wrap them up with a pretty ribbon and some cellophane. 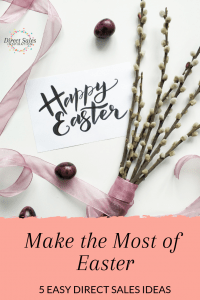 Offer these incentives to guests who book a party in April or in the week before Easter – whatever dates you want to highlight in your calendar. Adding some cute Easter eggs really adds to the visual appeal of your incentive. Fill a jar with small Easter eggs to create a guessing competition where people guess the number of eggs in the jar. You can use this an icebreaker at your in-home parties or take a photo of the jar and post it on your social media for an online competition in your customer group or on your business page. You’ll need a prize for the winners and you can also give away the jar itself as a prize at your last in-home party (or online) before Easter. Easter is a great opportunity to use a Chocolate theme in your parties. As you know I love themes – themes really help your parties to stand out and it will help you to get more bookings. I have a fun chocolate game you can download here but I’ve also got a host coaching trick and chocolate game combination – Chocolate Extravaganza -that you can read about here. 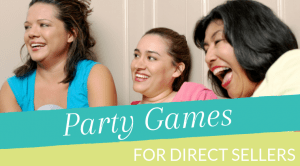 If you’re running any Facebook parties in April, you’ll want to add some Easter-themed games to your parties. Also add some tiles to your business page and customer groups to add some seasonal fun. Read this article on how to increase interaction and grab the free Facebook games. Our aim with our direct sales businesses should be to be remarkable. And little things like having a bowl of Easter eggs at the ‘check-out’ at your parties makes you stand out. I also like to pop in a few mini Easter eggs with my deliveries in the weeks leading up to Easter. Small thoughtful gestures like these make you remarkable!